This summer, members of the Colgate community gathered in the Ho Science Center atrium for the 2017 Upstate Institute Summer Field School poster presentations. Colgate’s Upstate Institute provides connections between the university and the regional community to engage students, faculty, staff, and residents in research and a reciprocal transfer of knowledge. Twenty-seven students were ready to take on questions as visitors learned about the fellows’ recent work in and around Hamilton. Here’s a sampling of this year’s work. The state of New York’s Climate Smart Communities program encourages counties and cities to take action to minimize the effects of climate change by pledging to fulfill 10 environmental goals, including decreasing energy usage and reducing greenhouse gas emissions. Eastwood has been helping the Hamilton community to reach Pledge Element 9: “Inform and inspire the public” by creating content for the Town of Hamilton website, making flyers, and encouraging the community to purchase locally and protect the environment. Kaitlin Abrams ’18 and For the Good, Inc.
Abrams teamed up with For the Good, a community organization based in Utica, N.Y., that manages two community gardens. For the Good allows children to volunteer in the gardens in exchange for fresh produce to which they might not otherwise have access. Abrams gets her hands dirty — literally — working with kids daily to grow and tend to their produce. She also works with teenagers who are employed at the garden for 15 hours per week through Utica’s Summer Youth Employment Program. As the summer draws to a close, Abrams will interview her fellow gardeners to learn just what it is that keeps volunteers coming back to the program year after year. The Fiver Foundation is a summer camp for disenfranchised children from New York City and upstate New York that aims to build character in youth. Children attend the camp every summer for 10 years, making lifelong memories and friendships along the way. Bianchi has spent her summer interviewing the children at the camp to learn just what it is that makes Fiver so special to them. 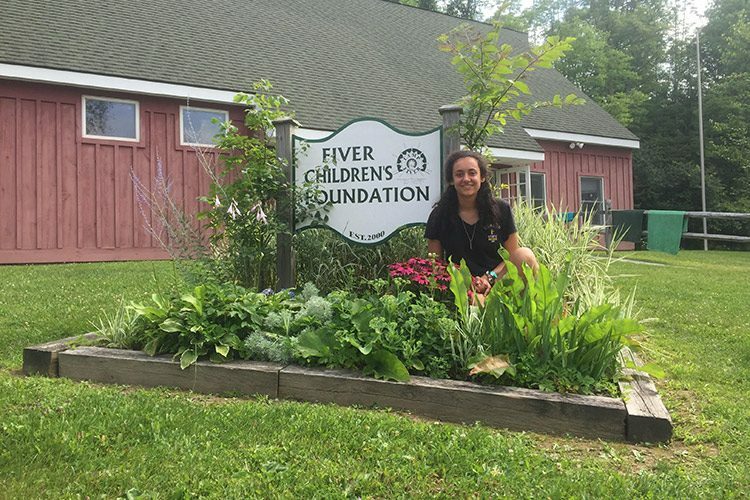 It is Fiver and Bianchi’s hope that the testimonials from children will show donors and parents firsthand the life-changing opportunities that only a summer camp like Fiver can provide. Integrating refugee and immigrant communities through microenterprise in Utica, N.Y.
As a One World Artisans intern, Dumas has been investigating Utica’s “microenterprise” — an opportunity for refugees and immigrants to earn a supplemental income by selling their traditional crafts at farmers’ markets and other local events. As part of her project, Dumas has had the opportunity to interview and learn the stories of five refugees who come from countries across the world, including Sudan, Iraq, and the Dominican Republic. Along the way, she’s also been helping the center research ways for the microenterprise to become successful enough to operate on its own. Many Colgate students and staff enjoy Lake Moraine for its beautiful water, boathouse, and recreation, but few people ever stop to consider the ecosystems below the surface. Working with the Lake Moraine Association, Sia investigated the abundance of invasive species in Lake Moraine by talking with boaters and examining their vessels before and after they entered the lake. He and the organization hope to increase public knowledge about invasive species in the lake through community outreach by updating the LMA’s website and publishing a list of species for boaters’ reference. Working with the PCD, an economic development nonprofit serving the Hamilton community, Donlan has spent her summer assessing the barriers for both low-income residents and farmers to participate in the Supplemental Nutrition Assistance Program (SNAP) at local farmers’ markets. Low-income residents currently cannot use SNAP benefits at farmers’ markets, thus preventing them from accessing local food. Additionally, various financial and time-related barriers deter farmers from implementing the program. With these barriers in mind, Donlan is researching ways to make SNAP benefits more universal and cost effective for both residents and farmers. “Utica, the town that loves refugees” – Is the name a perception or a reality? Becic spent the summer interacting with refugees in Utica, N.Y., to determine the attitudes of current residents toward the influx of refugees in the community. While one might think that most residents of Utica would be accepting of the refugees, generalized outbursts from current residents on social media condemning the refugees, their appearances, and their beliefs say otherwise. Regardless of how refugees are perceived in the community, Becic concludes that refugees have proved themselves an integral factor in the improvement of Utica’s infrastructure.